JERSEY CITY, NJ – 70 Columbus has burst onto the downtown Jersey City residential scene, setting a new benchmark for leasing velocity with 60% of the 545 rental residences leased in the first four months. The new 50-story tower developed by Ironstate Development Company and Panepinto Properties adjacent to the Grove Street PATH Station has successfully attracted residents from both sides of the Hudson River and beyond with a combination of modern residences, incredible social spaces and commuter convenience. 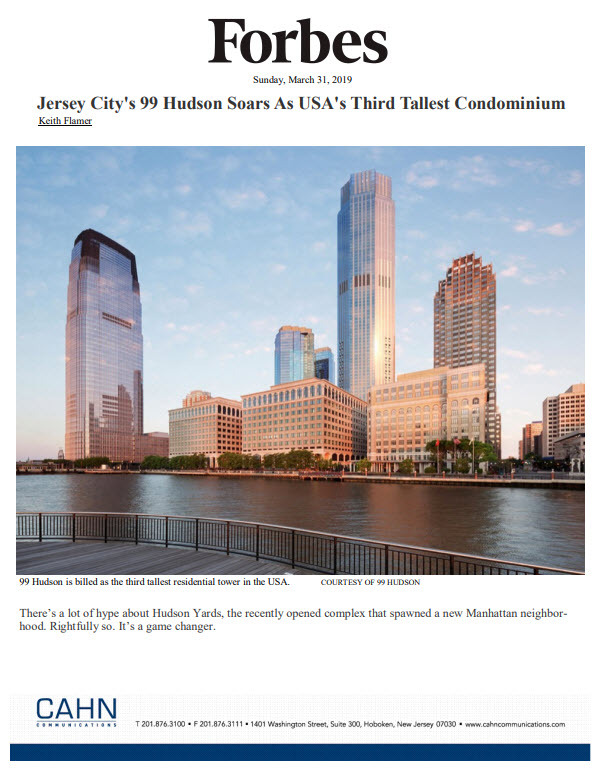 The fast-paced leasing activity, managed by exclusive leasing and marketing agent, The Marketing Directors, also reflects the rise of Jersey City as one of the region’s hottest residential destinations. The development team tapped Gwathmey, Siegel, Kaufman Architects (GSKA) to design 70 Columbus as an iconic addition to the neighborhood. The tower’s contemporary design, including dramatic window-bay columns that project from the building, is visually striking from all angles while maximizing unobstructed views of the Hudson River, downtown Manhattan and the Statue of Liberty. Common areas and indoor social spaces by Noé Duchaufour-Lawrance embody the famed Parisian designer’s unique aesthetic which is deeply rooted in his embrace of nature, color and shapes. These include a full-time attended signature lobby with fireplace lounge, a chic resident lounge and a children’s playroom, all of which are served by complimentary Wi-Fi. Residents also enjoy a 60,000 square-foot landscaped roof deck complete with a pool and private daybeds, sport court, grilling stations, a children’s playground and a dog run. 70 Columbus’ street-level retail space comprises a 30,000 square-foot Base Gym and a soon-to-open market that will offer natural and organic foods. Onsite parking is available. A collection of studios, one- and two-bedroom residences was designed for 70 Columbus to help enhance residents’ lifestyles. Airy, light-filled interiors feature oak wood floors, sleek kitchens with stainless steel appliances, quartz countertops and porcelain tile floors; oversized windows that frame the New York City skyline views while bathing the homes in natural light, and washer and vented dryer included in each home. Monthly rents currently start at $2,410 for studios, $2,850 for one-bedroom apartments and $3,950 for two-bedroom residences. Located at 70 Christopher Columbus Drive in the heart of the Grove Street neighborhood of downtown Jersey City, 70 Columbus offers residents easy access to Manhattan via the adjacent Grove Street PATH Station. The building is just steps from an eclectic array of restaurants, bars, cafes and shops, including Newark Avenue where a portion of the bordering street has been transformed into a pedestrian-only thoroughfare with a number of new hot spots. For more information on 70 Columbus and to make a private appointment to view the building’s furnished model residences and amenity spaces, call 201-433-7004, or visit www.70Columbus.com.